This tiny version of the Santa Maria, is the first ship in the "Walnut Navy". Made with hulls of half walnut shells, these little ships can be used as decorations for Christmas trees, or for mobiles. The sails are made from paper printables, and the version of the ship shown here can be made with or without the thread shroud and stay lines. If you wish, you can make the tiny ships slightly more realistic by carving shaped decks from balsa wood to rise above the walnut hull. I've set up this tutorial to show every stage of making the simple version. The printable sails you will need are linked to the materials list on page two of the instructions. Half Walnut Shell - Use the instructions for cracking walnut shells in half for ornaments. Fresh walnuts are easier to crack than very old ones. 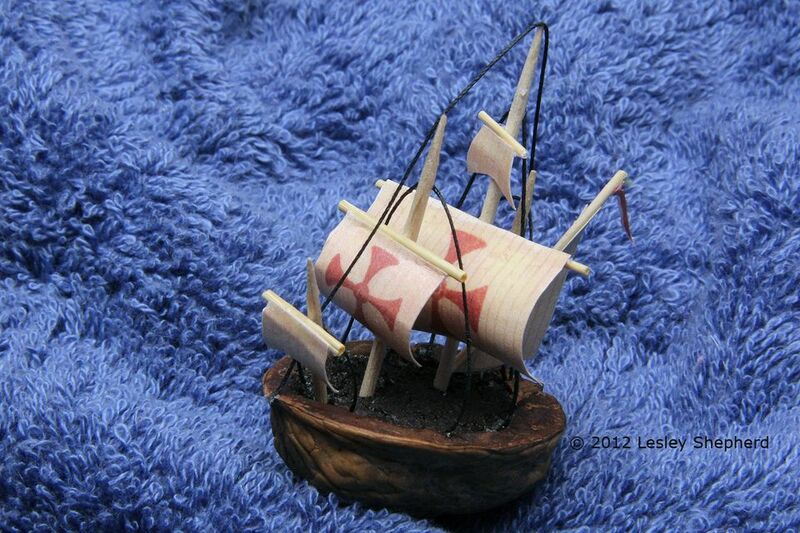 Round Toothpicks - you will need three or four for each ship. Fine Dried Grass Stems - or quilting thread stiffened with glue, or fine paper covered wire for the "yards"- the cross pieces which hold the sails on the masts. Sandpaper - to thin the toothpicks if you wish, I used 80 and 120 grit. Fine Black Thread - in my example I used quilting thread to make the lines easier to see in the photos, regular thread would be better. Dry Floral Arrangement Foam - or modelling clay, to hold the masts in the walnut shell hull. I painted mine dark brown to make the foam less obvious. Adults could secure masts in the shell with hot melt glue. Flat Acrylic Varnish or Clear Coat - Using a clear coating on the sails will help keep the curve set. Start making your miniature model of the Santa Maria by sanding at least three toothpicks evenly on all sides to thin them. You want your toothpicks to be roughly 2/3 as thick as regular toothpicks. If these boats are being made by young children you can skip this step, but it is an easy way to teach them to sand while working with a regular shape. In the photo on this page you can see three sanded toothpicks alongside a regular toothpick. The toothpicks were sanded with 80 grit sandpaper to size, then finished with 120 grit to smooth. To sand them easily, lay them down on a work surface, hold the pointed end of the toothpick and rub the sandpaper up and down the toothpick, rolling it gently as you sand so all sides are sanded evenly. The hull of the walnut sailboat will need to be filled with a material that can support the masts. I pressed a small section of rough cut dry floral foam into my walnut shell hull, and trimmed the foam across the top of the walnut shell using a polymer clay blade. I then painted the surface of the foam with a coat of dark brown acrylic paint and set it aside to dry. Children could use non hardening modelling clay instead of the dry foam. Whichever type of hull filler you use it should sit tightly into the walnut shell without moving. It needs to be secure to hold the masts. The sails for the Santa Maria need to be cut out and glued at the top edge to the yards or sail supports that will cross the toothpick masts. You can glue the sails back to back to make a sail which appears to be printed on both sides. The glued sails should be trimmed to shape before you glue them to the yards. To glue the sails onto the yards, you need to glue the sails to your sections of thread stiffened with glue, dried grass stems, or fine wire (# 26 gauge should be fine). Glue the sails as shown in the photo with space between them so you can trim the yards to size. I am showing the sails glued to short sections of grass stems that I used as yards, but you can glue all the sails to one piece of stiffened thread or wire. Be careful how you arrange the triangular 'lateen' sail on the yard. Line it up so it is attached to the yard as shown in the photo. Set the sails aside to dry. As you are working with the sails you may notice that there are two sets of sails laid out in different directions on the printable sail sheet. They are laid out this way to help you work with the natural curl or grain of your paper. Most letter paper curls from side to side, so you want the upper and lower edges of your sails running parallel to the sides of your paper. Experiment and see which sails curl best for you. When the sails are securely attached to the yards, gently curve the square sails to shape by laying them over a pencil, pen or other rounded surface. If you wish, you can apply a thin coating of clear acrylic varnish or clear coat to the sails and allow it to dry. This will help preserve the curve of the sails to make your ship look like it is moving forward in a breeze. One of your three toothpick masts will need to be divided into two sections for this next step. One toothpick will make both the 'sprit' that holds the small square sail out the front of the Santa Maria, while the other section will be the Mizzen-mast that holds the triangular 'lateen' sail at the back of the ship. The toothpick should be divided so roughly 1/3 is used for the sprit, and two thirds is used for the Mizzen-mast. Arrange your sails on your masts as shown in the photo on this page. All sails are kept free while the yard, or sail support is glued across the mast as shown. The triangular lateen sail is glued at a slight angle to the mizzen-mast. The largest square sail is glued to the tallest mast, the main-mast, with the small square sail with narrow shoulders glued above it. The smaller square sail with the cross is glued to the fore-mast to stand in front of the main-mast, at roughly the same height as the mainsail. The fore-mast is shorter than the main-mast. The other small square sail, the one which has the wider top, is glued so it hangs out below the 'sprit' that angles out towards the bow. (see photo). When all the yards are glued to the masts, leave them aside to dry. The long colored pennants can be glued to the top of the main-mast or the mizzen-mast. They can be glued on after any rigging lines are glued in place if you wish. Start positioning the masts by placing the 'sprit' just behind the pointed end of your walnut shell hull. The sprit is set into the 'deck' at an angle as shown. The sail should hang down straight at 90 degrees to the hull of the ship. The fore-mast is next in position, placed down the center line of the walnut shell hull, roughly 1/3 of the way across the shell as shown. The foremast should be set straight up and down. Trim the mast to length if necessary, to make it shorter than the main mast, and apply a bit of glue to the base of the mast before setting it in place in the floral foam or modelling clay of the 'deck'. The main-mast is set slightly behind the center of the ship, so that it is the tallest mast of the group. The main-sail and the fore-sail should be roughly at the same height, or with the main-sail slightly above the fore-sail. See photo this page. The final mast to be placed is the mizzen-mast with the triangular lateen sail. It is positioned directly behind the main-mast, and is set straight up and down, with the sail hanging at a sight angle. The sail will show completely on only one side of the mizzen-mast. With all your masts set into your hull, you can glue the colored pennants in place and call your model finished. If you wish a bit more realism, you can continue following the steps after this one to add the support lines for the masts. Shroud lines are the lines that anchor the masts from side to side in the hull of the boat. To make simplified shroud lines for your model, cut lengths of sewing thread longer than you need to go from one side of the hull to the top of the mast and down to the other side of the hull. Use finer thread than the quilting thread I show in the photos for clarity. Glue one end of each shroud line just inside the walnut shell hull lining up with the mast. See photo. Leave the glue to dry thoroughly before proceeding to the next step. When the shroud lines are securely fastened to one side of the hull, take each line up and glue it to near the top of the mast as shown, keeping the line of thread as tight and straight as possible. Have patience to hold the thread in place until the glue begins to catch. When the glue has dried at the top of the mast, take the shroud line down to the hull on the other side, and press it into a small amount of glue applied to the inside of the walnut shell hull. When the shroud lines are securely glued at both ends, trim any excess thread away from the join at the hull edge. The masts on a sailboat are anchored fore and aft with stay lines. To make a simplified version of these on your walnut shell navy version of the Santa Maria, take a piece of thread long enough to go from one end of the boat hull up and over all the masts and back down to the hull. Glue the thread inside the center back of the boat and leave until the glue is thoroughly dry. To finish gluing your stay lines in place, take your thread up from the back of the ship and glue it in place on the top of each of the masts, taking the stay line in a fairly tight line to the front or bow of the ship. Glue the end of the stay line to the inside of the bow, or pointed end of your walnut shell hull, keeping the line as taut as possible. Allow the glue to dry. When the glue is thoroughly dry, trim the fore-stay line where it is glued to the hull. You can now set your model in a display, hang it from a mobile, or add a thin hanging thread in order to use the Santa Maria as a tree ornament.